Have You Tried Learning Microsoft Word Without Computer? Harsh Reality of Ghanaian Education: Have You Tried Learning Microsoft Word Without Computer? Believe it or not, there are still places on Earth where people don’t have any gadgets! It has recently become known that school kids in Africa studied Microsoft Word using drawings on the blackboard. That is, without any computers! On February 15, a computer science teacher in one of Ghanaian village schools, Richard Akoto, shared a shocking Facebook post. 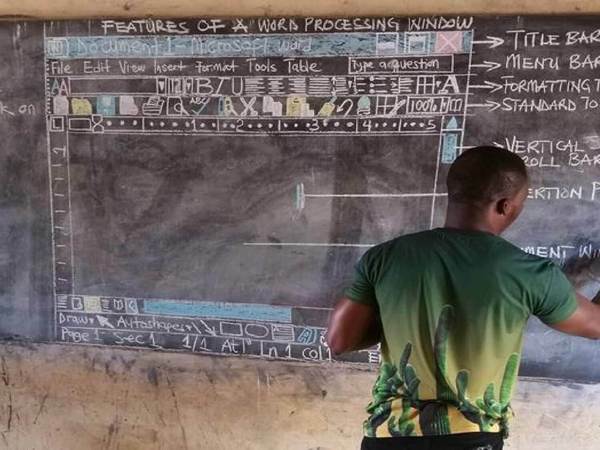 In the picture, the teacher is shown drawing Microsoft Word interface on the blackboard. Reportedly, it took him up to 30 minutes to draw the Word interface in detail. The post immediately went viral on Facebook where users offered donating their old laptops to school. Later on, the post landed on Reddit, where users were reminiscing how they studied in similar conditions. No electricity, no computers, no nothing. The teacher admitted that he was so dedicated to his students that he wanted to give them an idea of what Microsoft Word is. In his interview with Quartz, Mr. Akoto said the school needed 50 computers to hold full-blown lessons. In a month after Akoto’s post went viral, he started getting the first donations. First, a benefactor at UK’s University of Leeds donated a brand new laptop. Next, the NIIT computer school based in Accra, Ghana, donated 5 computers, a bunch of unnamed accessories, and computer science textbooks. The teacher was invited to Singapore for the Microsoft Global Education Exchange Summit, where he was “looking forward to learning something new.” Also, Akoto got a laptop for personal use. Internet users believe Akoto must be given Ghana’s ‘Best National Teacher.’ The annual teacher award comes with a prize of a three-bedroom house at a location of choice. Earlier, Akoto has shared his goal of preparing kids for the national ICT exam. He believes it’s unfair that kids from poor villages who have never used a computer get the same tasks as their wealthier counterparts. In 2017, one of the students taught by Akoto got the highest mark on the exam. 1 in 145 UK Teens Is Gambling Addict: Is Your Kid and Money In Danger? How Can UK Students Make Informed Higher Education Choices for Less Money? 4 WORST Myths About US Teachers: No Wonder They Are Striking!